WASHINGTON — President Donald Trump’s executive order banning refugees from entering the United States left much of the American Jewish community horrified — particularly as the announcement came on International Holocaust Remembrance Day. The order — titled “Protecting the Nation From Foreign Terrorist Entry Into the United States” — immediately suspends all refugee resettlement from seven Muslim-majority nations for 90 days and forbids those from war-ravaged Syria from entering the country indefinitely. The Anti-Defamation League’s CEO Jonathan Greenblatt vowed in a statement Thursday to “relentlessly fight this policy,” noting “our history and heritage compel us to take a stand.” The ADL, a Jewish civil rights group, monitors and combats anti-Semitism and other forms of bigotry across the globe. But that was before it was announced, when rumors were circulating that Trump would soon fulfill his controversial campaign pledge, which started as a “Muslim ban” and then morphed into a proposal to halt immigration from territories, particularly in the Middle East, where terror groups have a foothold. On Saturday, Greenblatt, who was not shy to speak out against Trump during the election, noted with revulsion that the presidential executive order was signed on International Holocaust Remembrance Day, likening it to passengers of the MS St. Louis, a German ship filled with 937 Jewish refugees, who were denied entry into the United States, as well as Cuba and Canada, in 1939. “It’s impossible to ignore, whether intentional or not, the tragic irony in executing the kind of order that kept Jews out of America, like those who perished on the St. Louis and countless others, on the day when we remember the unspeakable tragedy that befell European Jewry and the Jewish people,” he told The Times of Israel. On Twitter, Rabbi Rick Jacobs, the head of the Union of Reform Judaism, compared the order to the Dred Scott court decision upholding slavery in the antebellum South and the internment of Japanese Americans during World War II. 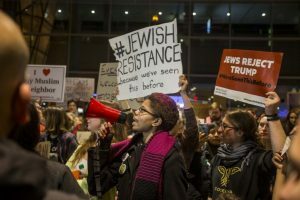 The American Jewish Committee also spoke out swiftly against the order, calling it “both unjust and unwarranted” in a Friday statement. Trump, said the organization’s CEO David Harris, is justified in wanting to assure a secure border that properly vets those who enter the country. But such blanket action is beyond the pale, he indicated. Trump’s executive action includes a provision that allows the US to admit refugees on a case-by-case basis during the freeze, as the government will process requests from people claiming religious persecution, but only if the religion of any such individuals is a minority religion in the respective country. The ADL, he explained, is preparing a course of action to combat that policy of the Trump administration and will be rolling out its plan this week. “We’ll be clarifying that in the coming days,” he said. B’nai B’rith International also voiced its objections, saying it was “deeply concerned” by the “drastic” plan. “While we acknowledge the very real threat posed by terrorists who aim to exploit our nation’s humanitarian instincts, a more nuanced and balanced approach to helping those seeking a safe harbor is clearly preferable, and more in keeping with America’s values, than the sweeping ban being imposed by the administration,” B’nai B’rith International President Gary P. Saltzman and CEO Daniel S. Mariaschin said in a joint statement. “Our country has a great, though sometimes imperfect, tradition of welcoming those fleeing oppression, persecution and unending civil wars,” they said.